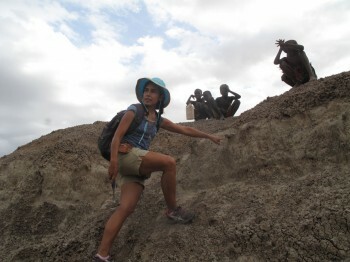 Amelia finding fossils in Koobi Fora, Kenya. As I approach the New Year, I have been inundated with thoughts of change: personal, political, social, and, always at the top of my mind, climate change. To explain, I’m a paleoecologist, which means that I study the interactions between animals and the environment thousands to millions of years ago. Since I’m in a paleoanthropology program, my research focuses on how climate affected human evolution. These days, however, I’ve been preoccupied with how I can help solve a different problem: how climate change will affect our future. Just how drastically different the future climate may be was driven home to me at a recent round of lightning talks at the Smithsonian’s Museum of Natural History. During these talks, paleobotonist, Dr. Scott Wing, suggested that, given current projections, the climate that his grandchildren will experience as adults will likely be more similar to the climate that existed approximately 50 million years ago during the Paleocene Eocene Thermal Maximum (PETM) than it will be to any climate that he experienced during his lifetime. This statement floored me and I would like you to understand why. Imagine a scenario with me for a moment. During the PETM, the earth’s atmosphere was injected with a huge amount of carbon, relatively quickly (in geological time). Scientists don’t know exactly where this carbon came from, or how much was released, but they have suggested that it might be similar to the amount that currently exists in all of the earth’s coal, oil and natural gas reserves. 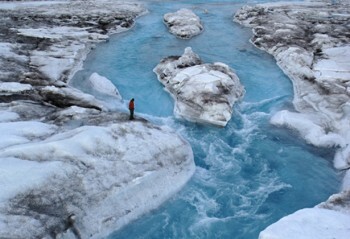 The result of this inundation was that earth became iceless. Global temperature rose 6-8 degrees centigrade. In the Bighorn Basin, Montana, where much of the data from the PETM derives, the average temperature rose approximately 5 degrees centigrade. Picture Montana as a dry tropical forest, similar to what you might find in Central America. Imagine those iconic Montana cowboys in shorts and sandals. Image of the poles as they may have been 56 million years ago, ice-free. Photo from National Geographic Magazine. Multiple scientists have suggested that the environments of the PETM are appropriate models for the earth’s future if we continue to burn fossil fuels at the current rate. My grandchildren will likely experience a world that I can’t even imagine, but I’m trying. Scientists approach this problem from many angles. I, for one, will spend my career collecting baseline data on how mammals dealt with climate change for the last three million years. Though the recent ancestors of many of the mammals on the planet never dealt with conditions similar to the PETM, there have been many drastic incidences of climate change in the last few million years that we can use to model how current ecosystems will deal with the projected climate change. I hope to work together with scientists in many other disciplines to prepare for the future and conserve some of the earth’s biodiversity using the past as the key to understanding the future. Before you walk away shaking your head at yet another bleak scientist’s blog, I would like to make clear that I didn’t write this blog to depress everyone at the start of the new year. In fact, paleoecologists have posited that variability in past climates drove human innovation. It doesn’t have to be all bad. We can simultaneously work to understand how to deal with these impending environmental changes in addition to modifying our most environmentally damaging behaviors. I focused this blog on climate change to bring attention to an important issue while all of us are thinking of ways to improve our lives in the coming year. I want climate change to be at the top of your mind when you make your new year’s resolutions. Perhaps this resolution may simply include becoming more informed on what to expect for the earth’s future. Happy New Year’s from everyone at CASHP!! Read more about the PETM check out this article from National Geographic. Or, this video made by Dr. Scott Wing. Or, you watch the talk that inspired this blog (and many others).